I am on jury duty today. Civil court, as it turns out. I last served in 2003, when I sat on one of the “murder and mayhem” grand juries (grand juries in New York specialize in drugs, family, violent, or white collar crime). On the violent crime grand jury we heard about a dozen cases, none of which I am allowed to disclose, though I will say that one of the accused had tried to kill himself by pressing a running power drill against his head until, I think, he broke the bit, then slashed his wrists, jumped out of an eighth story window, and survived. I proposed that we waive any indictment in exchange for this superman’s agreeing to be dropped on Afghanistan, but that power is evidently not available to grand juries. Anyway, since my last stint they have installed Wifi in the court building. 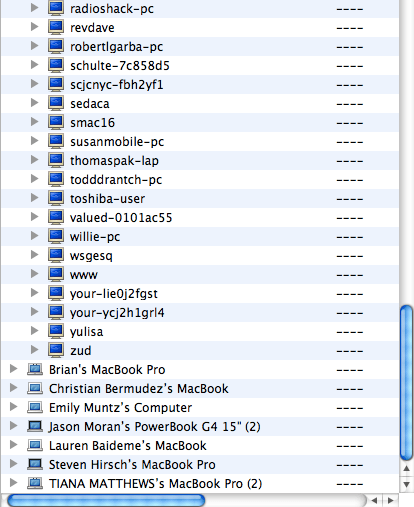 I’m seeing 47 unambiguous PCs on the network and 12 Macs, with another 56 I’m not sure about. All the official machines seem to be PCs. I’ve noticed one machine with a public directory featuring a bootleg collection of hiphop recordings. The man two seats to my right has fallen asleep and is snoring. Everybody else is jealous. This entry was posted in Uncategorized on September 1, 2010 by stern.